In a perfect world we GRAND ISLAND car owners would get into our automobiles in the morning and go about our business with no traffic on smooth roads. All the lights would be green, the air would be pure and a gallon of gas would cost a buck. In that world, following vehicle manufacturer vehicle maintenance recommendations might be all you would need to worry about. But of course – that’s not the way it works. There’s dust and pollution in Grand Island air, traffic jams and potholes. Issues with your car don’t come on a schedule – they just happen. That’s why Whitaker Auto Repair offers multi-point vehicle inspections. Our well-trained and experienced service specialists know what to look for and often uncover both minor and major issues for busy GRAND ISLAND motorists. There may be 3,000 miles to go before you’re scheduled for a new air filter – but if it’s clogged up now we’ll find out and fix it. If our technician observes an uneven tire wear pattern, they can investigate the root cause. You may not even remember that curb you hit two months ago that bent your tie rod end, but damage was done and a trained eye can see the effects. The multi-point inspection gives us an opportunity to inspect for the unexpected. We can help take care of little troubles before they become costly. Your car will perform better, be more efficient and safer. This is all part of the service and care we incorporate into our standard Whitaker Auto Repair procedures. Used vehicles are certainly an economical choice for budget-conscious GRAND ISLAND motorists. But how can we know we’re getting a good used vehicle and not just inheriting someone else’s problems? There are good used vehicles for sale in the Grand Island area. Cars are sold when families upsize, when families downsize, or even when someone just wants a new car. So the used vehicle may be just fine. But some GRAND ISLAND used car owners sell vehicles because they don’t want to deal with developing or existing problems. When you’re considering buying a used vehicle in GRAND ISLAND, ask for service records. Check to see if the recommended schedules for vital preventive maintenance have been followed. If so, you probably have a great used vehicle on your hands. If there aren’t any service records, then assume the worst. If the used vehicle you’re looking at is a late model vehicle with under 35,000 miles on it, take it to Whitaker Auto Repair for a full-service oil change. This critical inspection will reveal many basic or developing problems. 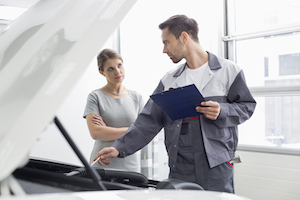 Talk to your experienced Whitaker Auto Repair tech about concerns you had on the test drive. Get a heads-up on needed repairs or important maintenance. Previously leased vehicles are often tempting to used vehicle buyers because they are generally newer models with low mileage and have been factory-cleaned. Be cautious, however. Many GRAND ISLAND residents that lease vehicles don’t bother with preventive maintenance because they know they’ll be turning the vehicles in. Again, ask for important maintenance records, take the vehicle in for a full-service oil change and consult with your experienced Whitaker Auto Repair service professional about any problems the vehicle may have. Older used vehicles are even more problematic for GRAND ISLAND used car buyers. Older vehicles simply come with more maintenance and repair issues than new ones. Take these vehicles in for a used vehicle inspection at Whitaker Auto Repair. Usually, a seller will let you do this before you purchase the vehicle. These inspections are very thorough and will help you know what you’re getting into. You’ll be able to make an informed decision about your purchase. That peace of mind will make the cost of the inspection more than worth your while. It’s always good auto advice for GRAND ISLAND drivers to purchase a Carfax report on any used vehicle. This report will let you know if the vehicle has been in a major accident and will give you a title history. You’d be surprised what used vehicle buyers have learned from those reports. Know before you buy. Once you purchase a used vehicle, give it some tender loving car care. Give it a thorough cleaning, inside and out — and don’t forget the engine compartment. A good wax will make it look and feel “new.” And, of course, stay on top of critical preventive maintenance. Used vehicles bought in NEBRASKA can last a good, long time if they’re properly cared for. They’re economical to buy, and they can keep on saving us GRAND ISLAND drivers money if we look after them. It’s always exciting for any of us GRAND ISLAND drivers to get a new car – even when it’s used. But it can feel like you’re going out on a limb a bit when you buy a used vehicle. I mean, car owners sell vehicles for a lot of reasons. Maybe they just wanted a new car, maybe there was something wrong with it, and maybe there was something really wrong with it. It’s important to order a report from a vehicle history service. This can uncover title issues and may reveal serious accidents or flood damage as well as any recall notices for the auto. Maintenance and repair records are a plus, but most GRAND ISLAND used car sellers don’t have them. Of course the best thing is to get your Whitaker Auto Repair service specialist to perform a used vehicle inspection. The inspection will go much deeper than just how good the vehicle looks and drives. You’ll get a feel for the vehicle’s overall condition, the status of major safety systems, and an indication of how well it has been maintained. You’ll get a good idea of any work that needs to be done – and that will help you ascertain an appropriate value for the auto. It’s pretty easy to see how an automotive analysis is worth the cost. If issues are uncovered, you can either steer clear of the automobile or bargain for a better price. If everything is OK, you’ll have a plan for addressing any routine services that should be done, not to mention a whole lot of peace of mind. It’s easy to fall in love with a vehicle – just don’t let your feelings cloud your judgment. Have Whitaker Auto Repair a used vehicle inspection so you will know if you’re getting a peach, or a lemon.